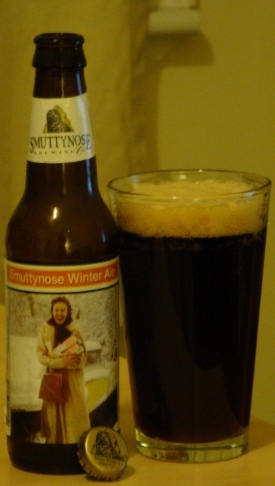 The winter offering from Smuttynose Brewing Company in Portsmouth, New Hampshire, is called simply Winter Ale. This milk chocolate colored beer has a nice pillow of tan head. The aroma is delicate. Toffee, chocolate, and caramel character predominate the moderately sweet nose. A faint spiciness almost eludes detection. The flavor is also somewhat sweet, caramel and chocolate mostly, but there is also some nuttiness and a significant spiciness. Earthy noble hops and a bit of alcohol accent this spicy yeast character. Overall a very intriguing flavor. The palate is big, almost chewy. It doesn’t seem cloying because of the significant spice and a fair addition of hops, but I’m still left licking sticky lips. This entry was posted on Thursday, January 12th, 2012 at 21:16	and is filed under American Ale. You can follow any responses to this entry through the RSS 2.0 feed. You can leave a response, or trackback from your own site.